I went into work on Monday and busied myself with a bunch of clean up tasks, but ran out of work by 2:30PM. I was waiting for the office manager to finish job costing before I could move into the normal closing duties, but she didn’t appear to be close, so I informed John that I’d probably be fishing on Tuesday. Now I needed to pick a destination. On Tuesday morning after I’d packed everything in the car, I began looking at the stream flows for streams closer to Denver. 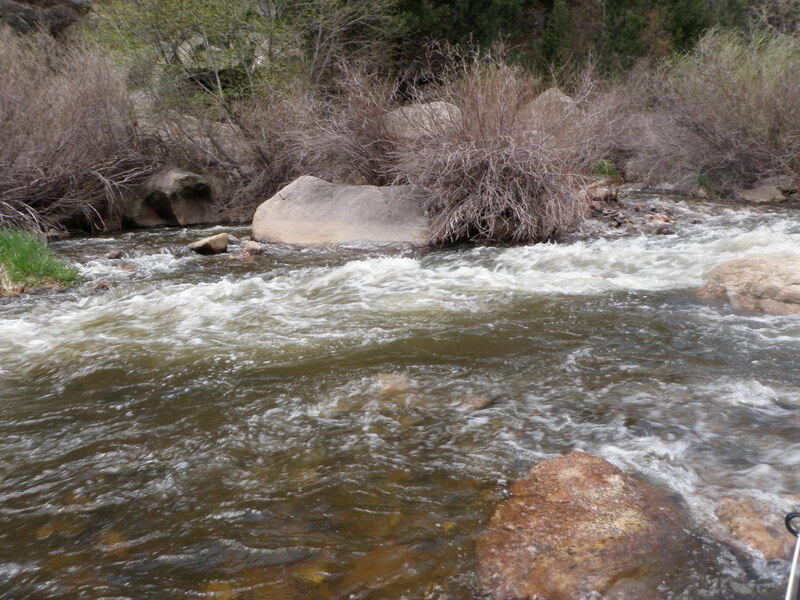 Originally I considered the North Fork of the St. Vrain below Buttonrock Reservoir, but the gauge in Lyons was reading 150 cfs and had increased pretty dramatically over the last three days. There is no gauge on the North Fork below the dam, so it was a gamble to make the 1.5 hour drive only to discover that they were releasing more water. The Big Thompson was up to 130, and that’s pretty heavy flows for that small streambed. Next I checked Clear Creek and the flows there had jumped significantly over the last few days. 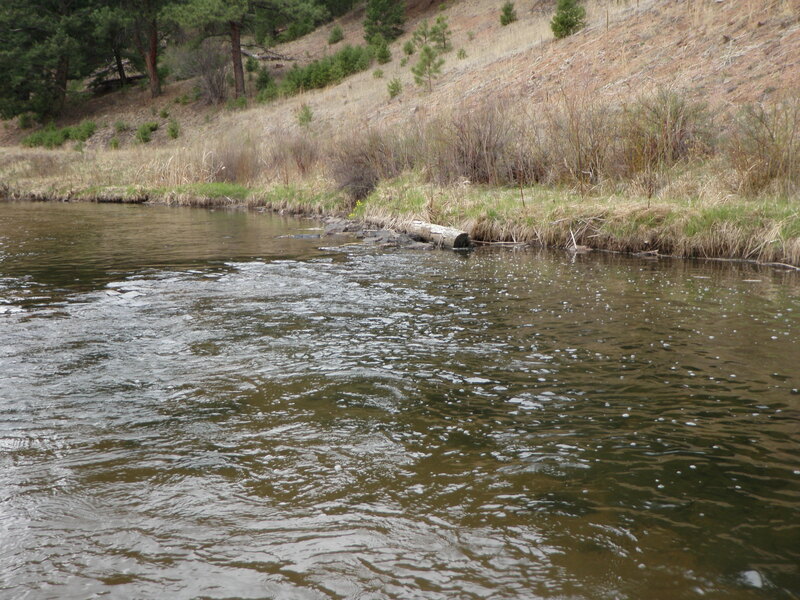 Bear Creek was looking good at 22 cfs, but this is a small stream with relatively small fish. 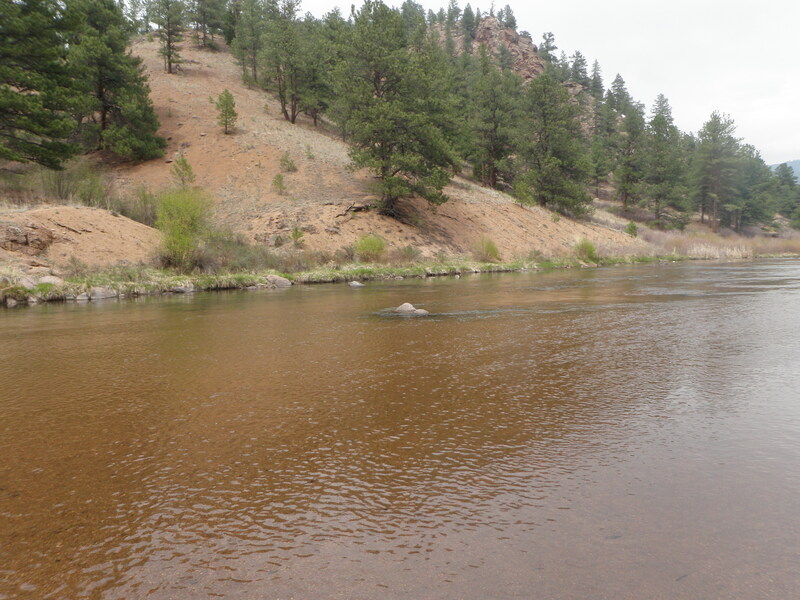 Finally the South Platte River near Deckers was running at 118. This is actually quite low, but I figured that was a better problem to face than high flows. I arrived at the bottom of Nighthawk Hill and turned left to head up the river toward Deckers. I elected to turn into the pullout just before the Osprey Campground. It was around 10:30AM when I began fishing with a yellow Letort hopper and beadhead hares ear. It was overcast and chilly even though the forecast called for highs in the low 70’s. There were a few short periods when the sun broke through the clouds, but it was quite chilly for most of the day and the wind picked up in the afternoon. I actually wore a fleece and raincoat most of the time. I began fishing a wide riffled area but had no action. I did spot a couple nice sized fish that I kicked out of their lairs as I waded upstream through a rocky area. I reached a spot where the river splits around a small island and prepared to work up the smaller right channel. But there was a thin seam where the currents rejoined below the island, and I made several casts into this area. On perhaps the fourth drift, the hopper paused, and I set the hook and landed a 10-12 inch brown. Good, there were fish in the river, and I got one to take my fly. Next I waded up the shallow tail of the right channel to a spot where historically I landed many nice fish next to a beaver house. The beaver house was no longer there, but there was still a small riffle feeding a small pool. Once again toward the tail of the pool the hopper paused and I set the hook and had a one second hook up with a fish that I saw dart upstream upon release. I retreated back to the main left channel and worked my way upstream prospecting all the three and four foot slots behind exposed rocks. When I’d gotten to the top of the rocky riffle stretch before the long pool by the campground, the hopper paused again, and I set the hook. A nice brown shot down past me and I regained line and gradually worked it to my net. 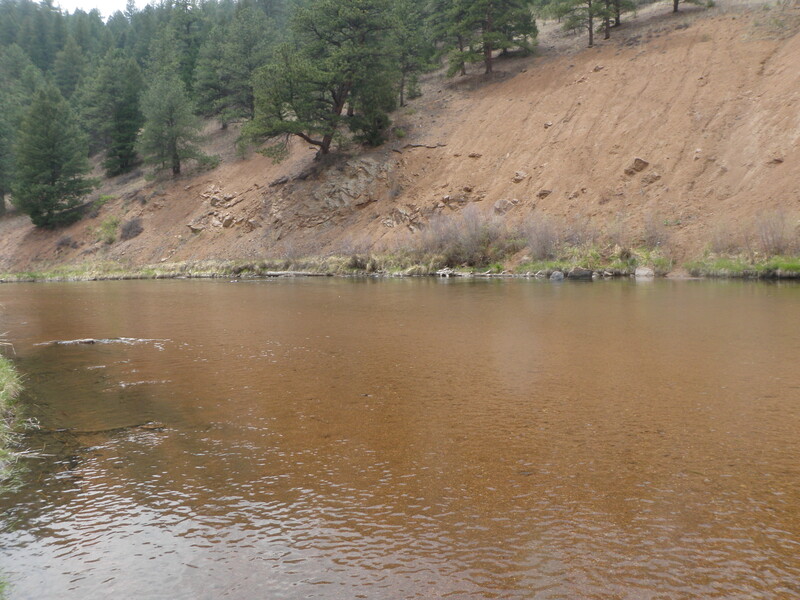 The brown was a nice 13 inch fish that put up a nice fight in the riffled area. I continued fishing the slow moving water at the tail of the long pool, but when I got across from a bare area where fishermen entered and exited the pool, I decided to go back to the car and eat lunch before continuing. It was 11:30AM when I broke for lunch. I decided to drive above the campground (it costs money to park in the campground parking lot), and look for another pullout since I planned to fish upstream. But there weren’t any parking spaces for quite a distance, so I returned to my original parking space and ate lunch there. After lunch I hiked back up the road to the campground and waded into the tail of the pool. Fortunately I’d added another layer because it was quite cloudy and windy. This bit of nasty weather was apparently to the liking of the BWO’s and I spotted a smattering of small mayflies on the water. As this happened, I also spotted some sporadic rises along the far bank. I tied on a size 22 CDC BWO and began casting to the spots where I’d seen the rises. I experienced one refusal, and then the rises ceased so I moved up the pool a bit where there was a small riffle and then some nervous water between the riffle and the bank. I observed closely and spotted some very subtle dimple rises occurring very regularly. I rested the water a bit, and shot a cast to the area of dimple rises. I checked the cast high so the fly fluttered down gently in a pile. I couldn’t see the fly very well, but spotted a rise near where I estimated the fly to be, and set the hook. I was attached to a leaping brown trout. It must have jumped out of the water five times before I brought it in and released. This fish was another 13 incher, but chunkier than the previous one. I moved further up the pool looking for additional rises, and spotted only one more. I couldn’t generate a rise to my fly until I moved above it and drifted downstream. On one of these casts I had a split second hookup. Next I reached the top of the pool and the water changed to faster runs and riffles, so I went back to the hopper/dropper but added a RS2 below the beadhead hares ear. I covered quite a distance over the next couple hours prospecting with the hopper/dropper combination. By 3PM I was getting pretty bored with the fishing. It was very cloudy and chilly, but I wasn’t seeing any additional flies, so I decided to go back to the car and drive back down the river to the Whale Rock area with the rock garden stretch that I enjoy. I parked at Latino Landing and walked up the road a bit to the area I targeted. Another fisherman with his dog appeared just above the area that I wanted to fish, but he fished the upper area a bit and then did a U turn. I stood and observed the water for five or ten minutes, but saw no activity. I didn’t want to disturb the nice water with my hopper/dropper so I tied on the CDC BWO and climbed up on a large boulder with a slanted top and lay on my side. Apparently I dozed off for a few minutes, but when I awoke I spotted a rise tight next to a protruding rock 15 feet above me. I dismounted from my perch and got in position to cast. The wind was blowing a bit making it difficult to place the cast where I wanted it, but on the fifth attempt I wrapped a cast to the left. The brown jumped on it instantly and I landed an eleven inch feisty fish. Seeing no more rises in the sweet area where I’d caught the previous fish, I decided to explore the left bank. The current caressed a huge boulder along the bank, and I’d had success there before. The CDC BWO is not a great fly for prospecting, and I’d seen occasional caddis, so I tied on an olive body deer hair caddis and flicked it to the top of the run along the rock. Immediately a small six inch brown smacked my fly, and I quickly landed and released it. I watched the water for another few minutes and then prospected the top third of the area with the caddis, but nothing was doing. It was now 4PM, and I was feeling quite chilled so I called it quits and drove back to Denver. Temperatures cooled somewhat from the balmy Mothers’ Day high of 85 and were expected to reach mid-70’s on Tuesday. I had a lull at work waiting for the office manager to catch up so I decided to take a fishing day. Jane and I had tickets for the Mets vs.Rockies at 6:40, so I needed to return earlier than normal. 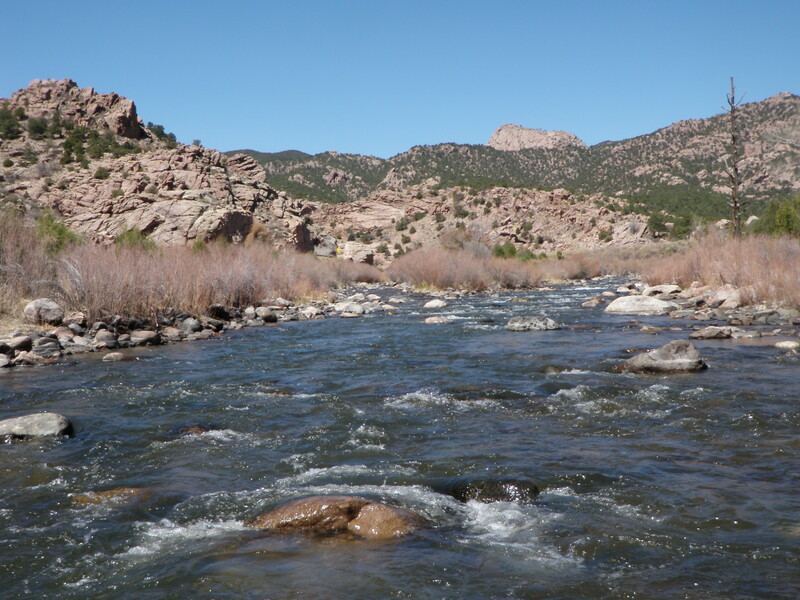 I was weary of the long drive to the Arkansas River with high expectations and low returns, so I checked out the flows on alternatives as it was getting late in the pre-snowmelt season. 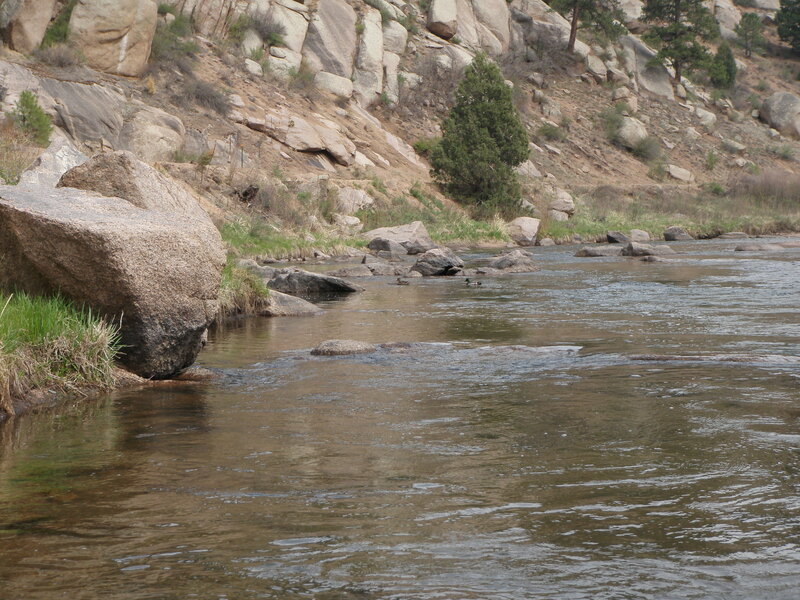 I had seen the St.Vrain and Big Thompson on Sunday during our Mothers’ Day trip so I knew they were likely fishable. The Big T flows jumped from 65 to 95 on Monday, so I was a bit concerned, but decided to give it a try. When I arrived in Estes Park to make the turn to the river I looked at the thermometer in the car, and it was 43 degrees. I kept checking it as I drove down the canyon along the river to the Waltonia Bridge pullout, and it moved from 43 up to 50 by the time I parked. The river looked clear but higher than ideal. I rigged my rod and walked upstream beyond the bridge. The water was pretty rapid here and somewhat murky with minimal slower water where fish could hold. But as I gazed down at one of the three foot wide slots along the rocky bank, I spotted a couple fish holding a foot or so below the surface. I tied on yellow Letort hopper and trailed a beadhead hares ear and then a beadhead emerald caddis. 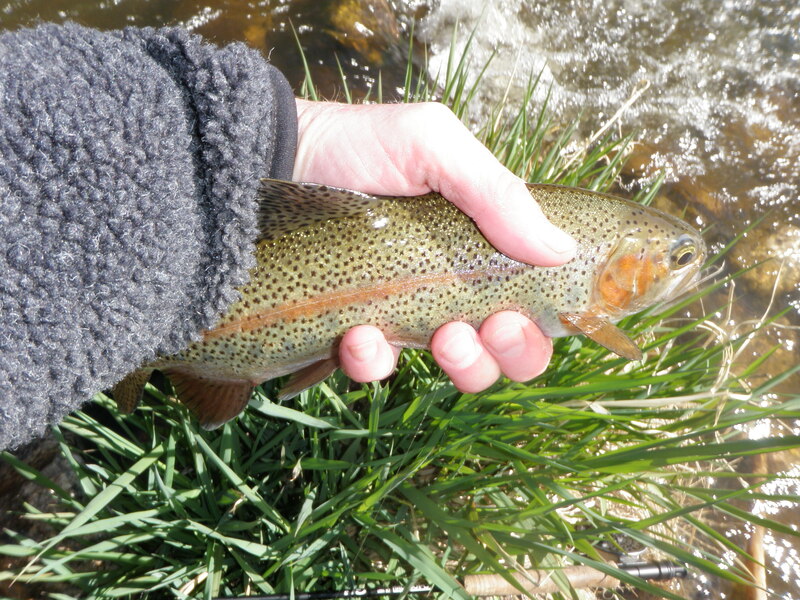 It wasn’t long before I hooked and landed a rainbow in one of the narrow slots along the rocks on the BHHE. The rest of the morning pretty much followed this routine. I skipped over a lot of rushing, churning water and fished only the soft slower moving pockets and pools along the right bank. The BHHE was out producing the caddis pupa, so I switched their positions fairly early. By 11AM I’d landed 8 trout, all rainbows and five on the BHHE and three on the emerald caddis. I returned to the car and immediately removed one of my layers as the sun was out and the air temperature was now 60. As I walked back to the car, I observed some nice slack water on the opposite bank so decided I’d try to cross the bridge and work up along the left bank. But as I was eating, I noticed a car and person moving about in the cabin behind the one closest to the stream. I wasn’t sure if I’d be trespassing if I crossed over to the other side as two cabins were moderately close to the stream, so I elected to drive back up the highway to the closest pullout to where I’d ended the morning and began fishing where I’d ended. 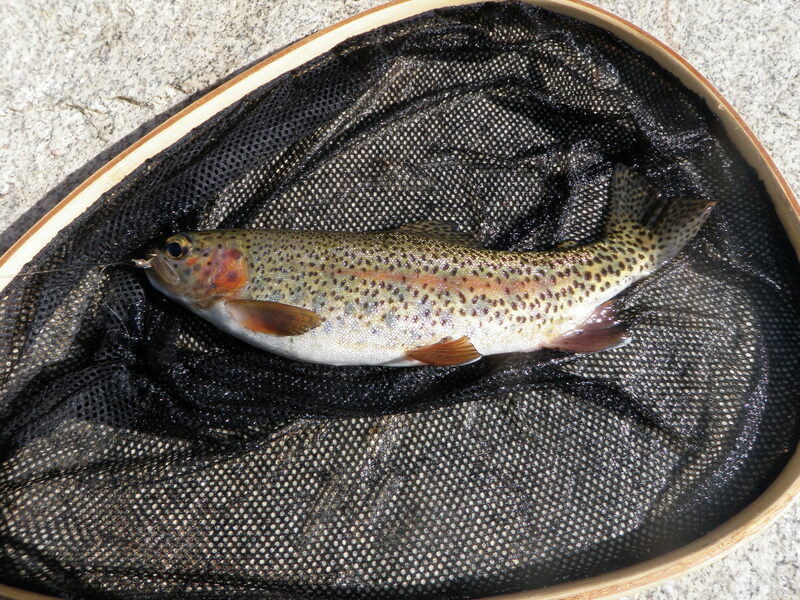 After lunch my catch rate slowed as I landed 5 more trout between 11:30 and 2PM. I attribute this to the fact that I was fishing along the highway where numerous fishermen access the river and apply pressure. Ironically I began to get more action on the emerald caddis so I reversed their positioning again. 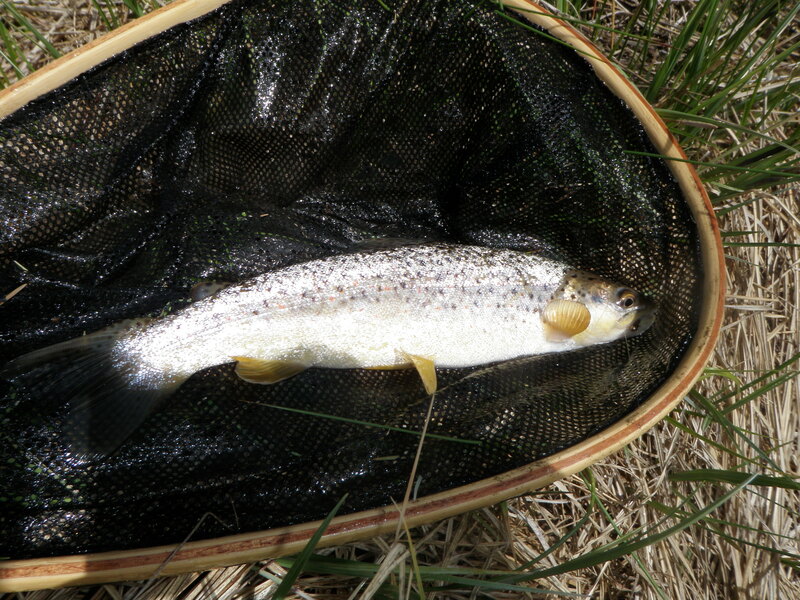 Two of the trout after lunch were browns and the remaining three rainbows. Four succumbed to the emerald caddis and one of the browns took the beadhead hares ear. There was minimal insect activity as the wind and air temperature warmed up. Facing a 1.5 hour drive back to Denver, the possibility of early rush hour traffic, and desiring to take a shower and gather up snacks and gear for the game caused me to quit at 2PM, and I was on the road at 2:30. My obsession with meeting the 2011 Arkansas River caddis hatch drove me to make another Thursday trip to the lower river above Royal Gorge. I reviewed the reports on ArkAnglers and Royal Gorge Anglers. 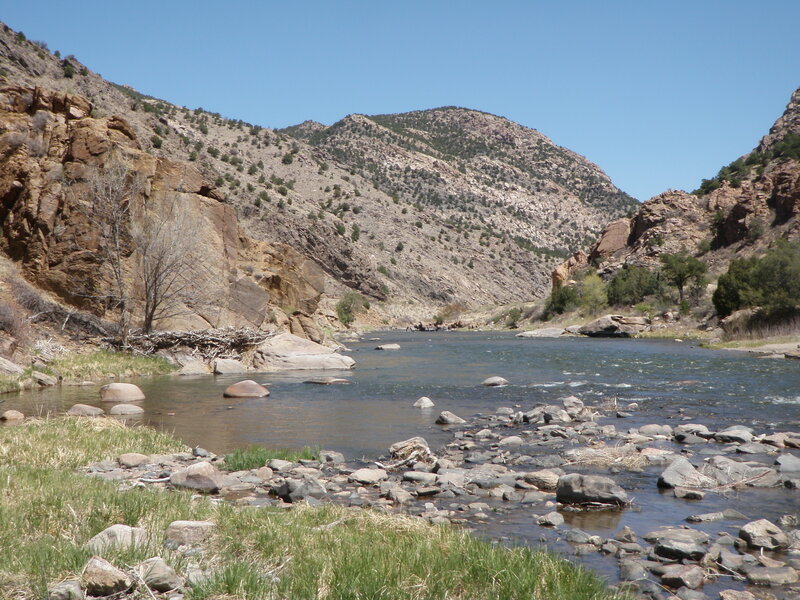 Both indicated the hatch had advanced up the river as far as Coaldale, but the wording led me to believe it wasn’t the all out blizzard hatch that fishermen seek, so I decided to focus on the lower river near Texas Creek. I got off to an early start again and the day was forecast to be beautiful with temperatures in the low 70’s. This would prove to be accurate with clear blue skies all day and only moderate wind from time to time. 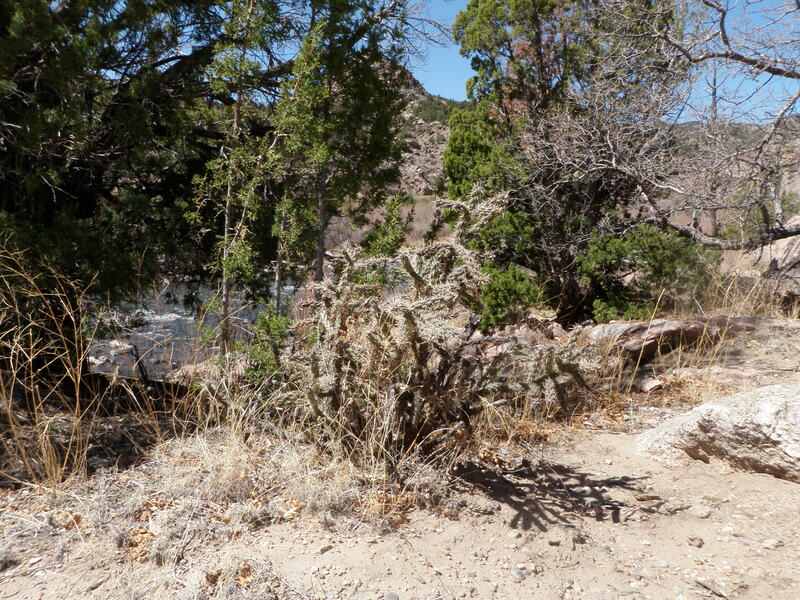 I crossed the river at Texas Creek and parked in the fisherman parking area and hiked down the path beyond the abandoned ranch and then descended the bank to the river below the island. I was encouraged to see no competing fishermen even though there was another car in the lot. The flows were up from the previous week and the water was tinged with some murkiness, but still relatively clear. With the higher flows I decided to go deep with nymphs and rigged up a double nymph set up with a beadhead prince as the top fly and a beadhead emerald caddis pupa on the end. I worked the juicy run below the island from top to bottom and then back up again, but with no success. I thought this was unusual, but moved up the right channel and covered all the likely spots. In this stretch I had several one to two second hookups, so I was at least beginning to attract some attention. I dropped back to the downstream tip of the island and worked my way up along the south bank of the island. When I reached the nice pockets toward the top of the island I finally hooked and landed my first trout of the day on the emerald caddis. Somewhere during this time I tore off both the flies, so I reconfigured with another prince nymph and a bright green caddis pupa this time. I moved above the island to a nice stretch of long riffles over a rocky bottom with moderate depth. In this area I experienced several more 1 -2 second hookups. At 11:30 I exited the river and hiked back to the car for lunch. I’d landed one fish, but had at least four or five opportunities that I failed to convert. I grabbed my lunch bag and skipped over the fence at the bridge and sat on the beach below the bridge to eat while observing the water. I spotted very occasional caddis flitting about, but no fish or rising activity. After lunch I returned to the parking lot by way of the old cabin and shook some willow branches along the way. Hardly any caddis erupted from the branches as would normally be the case if the heavy hatch had advanced to this point. I stashed my lunch back in the car and grabbed my rod and gear and decided to hike down the path as far as I could go. This led me to a sweet spot where some large vertical rocks blocked further progress without climbing to the railroad tracks which were blocked by a barbed wire fence. I climbed out on a large rock that served as a small pier at the end of a pool formed where the river angled in toward the north bank. I drifted my nymphs through this area, and while doing so another fisherman arrived and positioned 30 yards above me beyond the nice pool. 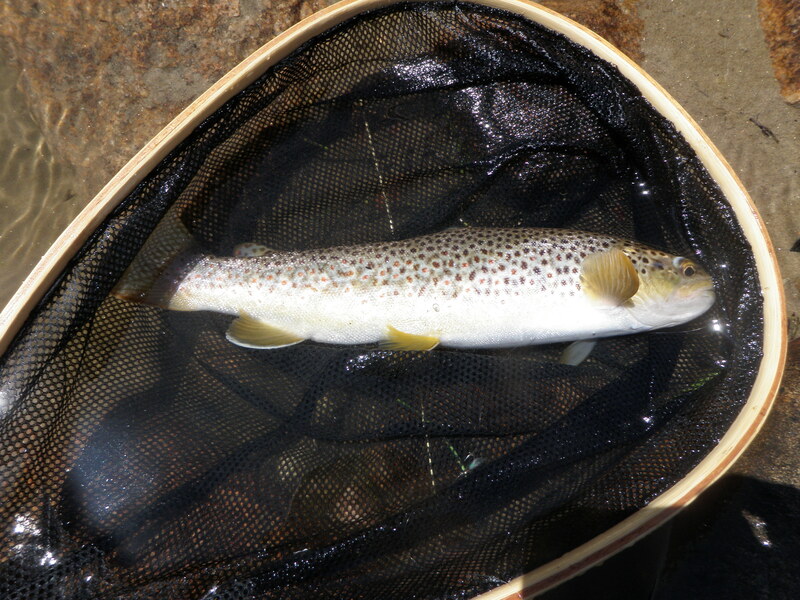 I did notice several BWO’s floating on the surface in the deep pool, but had no action so I exited and climbed up the hill and skirted the other fishermen and went 50 yards up the river before cutting back to the bank to resume my quest for trout. I fished some shallow runs behind rocks and then decided to switch the flies again. I moved the caddis pupa to the top fly, returned the prince to my foam pocket, and added a RS2 to the end of the leader. With this combination I continued fishing up along the right (north) bank. 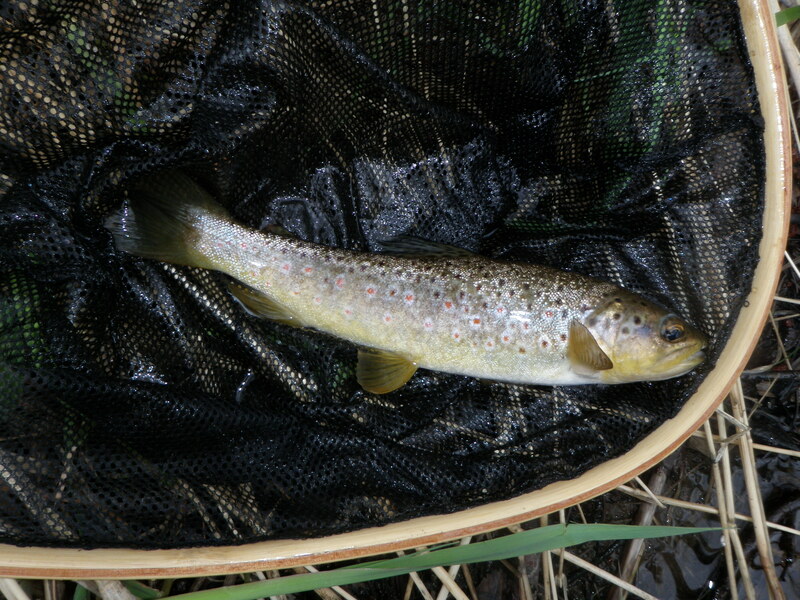 The next hour or so from 1-2PM resulted in my most consistent fishing of the day as I landed four browns on the RS2. Two of the fish were a bit larger than what I’d been catching over the last two outings. I also was frustrated to experience two or three additional quick releases. When I reached the bottom of the island where I’d begun in the morning, I noticed several fishermen working around the island. The sky was bright blue and it had warmed up to the low seventies. 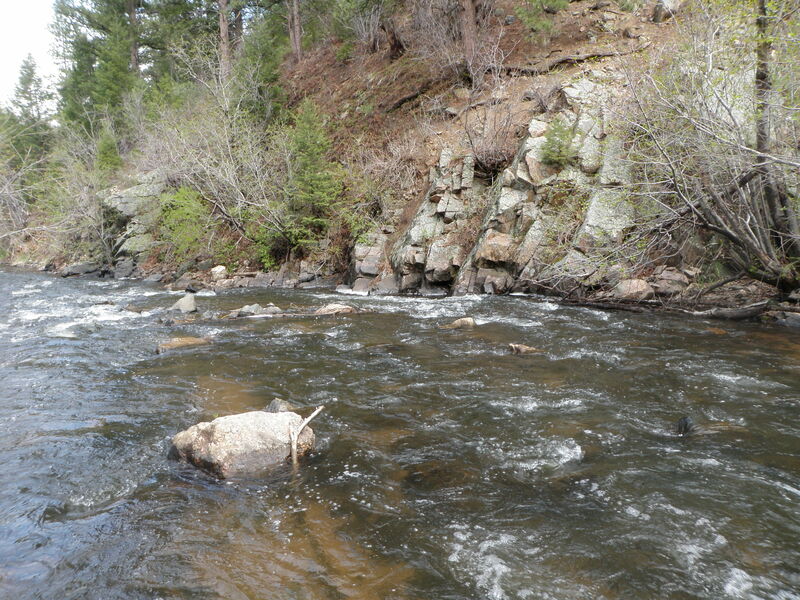 I was seeing no caddis hatching activity or BWO’s for that matter, so I decided to head back to the car and drive back toward Royal Gorge and test the waters below Spike Buck where I’d had a 17 fish day several weeks ago. This was along the way on my return to Denver and also closer to Canon City where caddis were supposedly hatching for several weeks. I parked the car in a small pullout and dropped down to the river and worked the nymphs up along the left bank for 20 yards with no success. Once again when I shook the shrubs and branches I saw no evidence that a heavy hatch had occurred. When I reached the area where the river widens a bit and creates some nice shallower eddies and pools, I clipped off the nymphs and tied on a bushy size 14 caddis. I thought I’d prospect with it a bit in the shallower areas and perhaps interest some fish. It was a nice thought, but didn’t work so I quit fishing at 3:30 and returned to Denver. 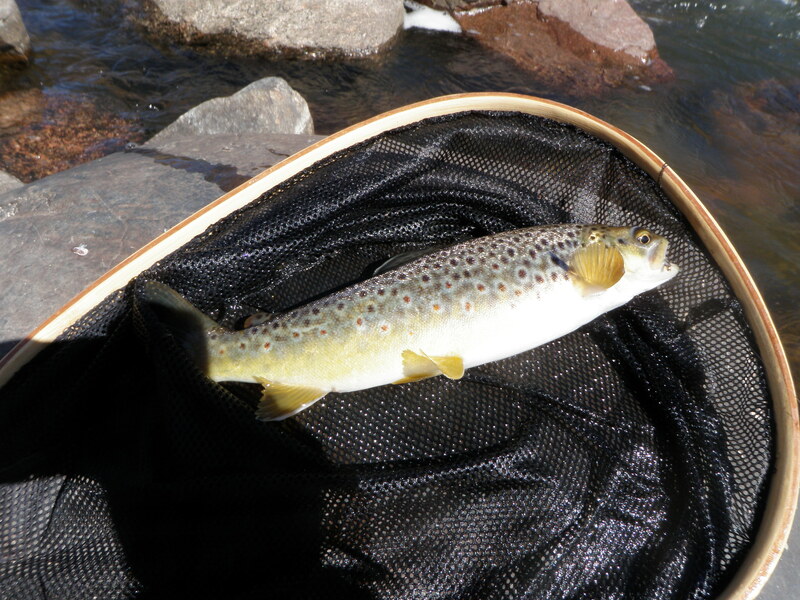 With the return of cool weather I knew the caddis hatch continued to stall in Canon City in spite of optimistic reports coming out of Royal Gorge Anglers. But based on my decent outing the previous Thursday, I felt I could catch my share of fish even without a blizzard hatch. 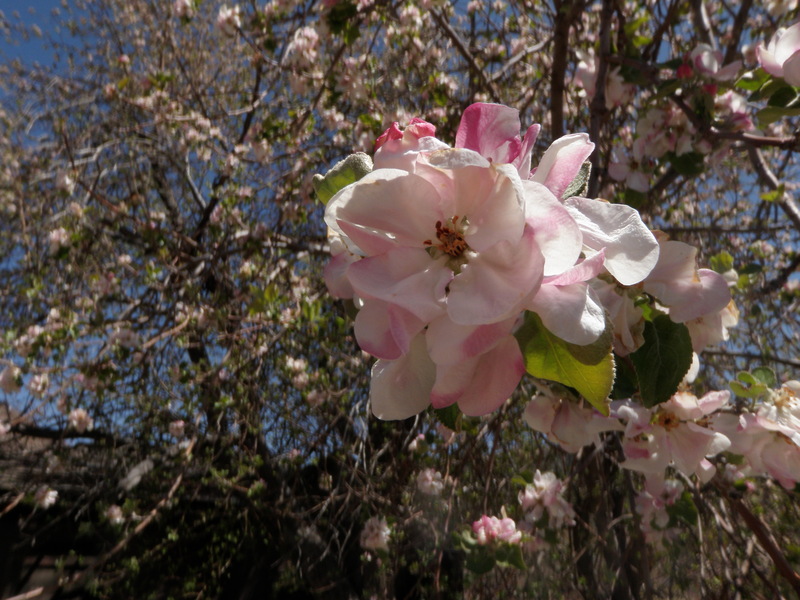 Temperatures in Canon City were forecast to reach 72, so I felt it would be a nice day with a small chance of the big hatch kicking in. I decided to park at the braided area I’d fished when Jane accompanied me two trips ago. There was another car parked in the pullout, but I didn’t see fishermen. Once I’d rigged my rod, I walked down the highway a bit to check out the very small braid that runs next to the highway. Some beavers built a dam at the bottom just before it rejoins the main river. I crossed below the dam and put on a caddis dry fly and flicked some casts into the pool created by the beaver dam, but I couldn’t see signs of any fish in the clear water. I walked to the small run at the top of the pool and made a couple casts there. Next I waded across the tail of the main braid next to the highway and went up along the right bank next to a beautiful run and pool. I cast the caddis in some attractive areas of moderate depth, but again no fish. I decided I’d like to try the north channel, my favorite, while it was devoid of other fishermen and while I had the caddis on my line. I crossed over the next channel and then followed the bank to where the north channel met the main stem and made some casts in the first tail and pool. Nothing was developing, so I clipped off the caddis and tied on a yellow Charlie Boy hopper and dropped a beadhead prince and then a beadhead emerald caddis pupa. I landed a fish on the prince, but then hooked up on a pair of fish that seemed pretty nice, but they freed themselves rather quickly. Something felt odd about these fish, so I finally brought my flies to hand and inspected them. I quickly found the answer. I’d tied the last fly on backwards. The tippet was tied to the bend of the hook with the eye facing forward. I had used the caddis pupa as the top fly on the last trip with an RS2 beneath, and returned the pupa to my foam pocket with the leader attached. I forgot to clip of the pupa and tie it back on in the correct manner. I reversed the direction of the fly and continued fishing the three fly combination up the north channel for the remainder of the morning. I landed three more small browns while covering quite a bit of normally very productive water. Three of the fish grabbed the prince nymph and one nailed the emerald caddis pupa. At noon I waded back across the intervening channels and returned to the car for lunch. After lunch I wanted to resume on the north channel from where I’d ended the morning, but when I approached the stream I spotted another fisherman who had worked his way up behind me. I reversed direction and went back to the main channel by the highway and worked my way up along the right (north) bank probing all the likely pockets and runs with the three fly combination. 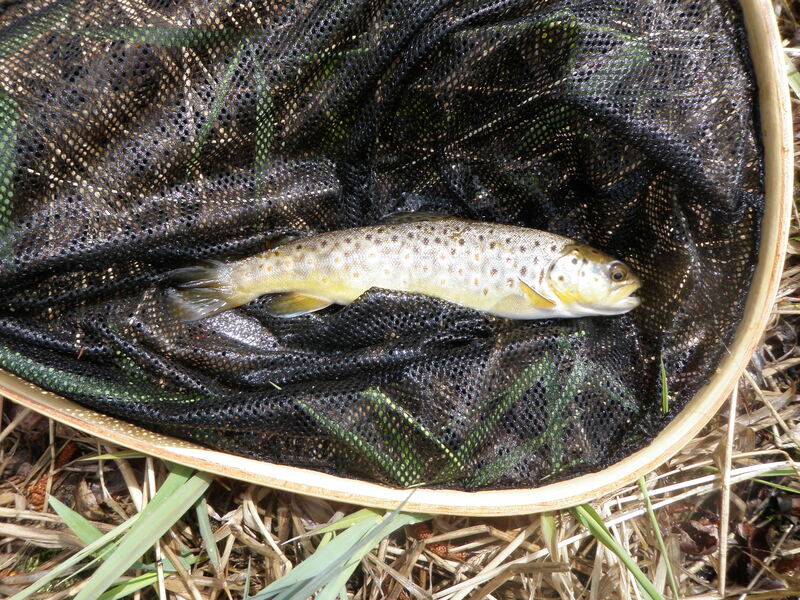 I managed to catch a small brown in a juicy run at the head of a nice long pool on the emerald caddis, but the rest of the nice water that normally produces fish, yielded nothing. The sky remained pure blue with hardly any clouds and it warmed to the low 70’s. There was no evidence of caddis or BWO’s. I walked back down to where I’d ended the morning, and the other fisherman had disappeared, so I worked up the north channel to the top where it spilled away from the main channel. I couldn’t even get a refusal. It was now 2:30 and I had lost confidence and decided that a change of scenery was in order. I remembered a trip two years ago when I fished up the small Texas Creek tributary and caught some nice fish relative to the size of the stream, so I decided to explore it again. I made a left turn and drove .2 miles to the first pullout and parked. I hiked along the road for a ways until I saw a place where the fence was down. I scrambled down the bank and over the fence and through the willows to the small stream that was low and only five feet wide at most places. I tied on a Chernobyl ant and trailed a prince nymph and began flicking the flies into all locations of enough depth to hold fish. The next hour and half held amazement and frustration. I had several momentary hookups and numerous refusals on the Chernobyl Ant. My amazement stemmed from the quantity of wakes and darting fish that I spooked in the low clear water. I was unable to land a single fish although I spotted at least 30 fish in a short stretch of Texas Creek. At 4PM I’d experienced enough frustration and called it a day.